During an unexpected trip to San Antonio this past week, I made a couple of pilgrimages to visit my former colleagues at the Alamo. I began my public history career there–indeed, discovered public history–when I was hired as a history interpreter during the summer of 2000. I repeated that role after I graduated from Pitt in 2002, and again after I left Peace Corps in late 2003. When I worked there, those of us wearing red vests (pictured) were stationed at different points in the shrine and Long Barrack, answering questions. We also gave twice-daily history talks. I went for the Alamo’s monthly First Saturday event, a new addition since I left in 2004. First Saturday is only one of many new things the Alamo Education Department has introduced. 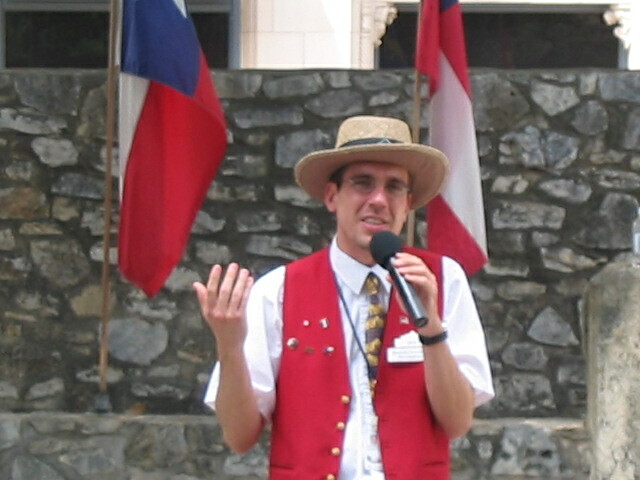 While being stationed at the various locations and giving history talks is still the bread and butter–as it should be for a site that often gets above 10,000 visitors per day–the Alamo has begun other programs, including an audio tour (originally outsourced, now produced by the Education Department), a new exhibition in the Long Barrack Museum, a summer camp, and a battlefield tour. All of these programs have involved a great deal of personal interaction at the actual site, helping visitors understand the seminal, and often misunderstood, battle. Indeed, that is one of the site’s strengths–that visitors can have in-depth conversations with knowledgeable interpreters, not only read text panels. Another of the site’s strengths–what drives the other strengths–is the fact that the Curator/Historian, Richard Bruce Winders, heads the Education Department. Wait, a curator, leading an education department in a museum? Indeed. The education department is merged with the curatorial staff. Dr. Winders himself is often out in full gear at living history programs, leading teacher workshops, and interacting with the public. In fact, until I came to Washington to begin my Museum Studies M.A., I didn’t realize that education departments and curatorial departments were often separate–and sometimes not collaborative. This versatility does not make Dr. Winders any less of a scholar. He has published four books–his dissertation book on the U.S. Army during the U.S.-Mexican War, books for general audiences about the leadup to the U.S.-Mexican War and about the Battle of the Alamo, and a kids’ book on David Crockett. From my time working with Dr. Winders and the other education staff, I learned that being a top-notch interpreter does not preclude being a top-notch scholar, and vice-versa. Long and short, the Alamo Education Department is doing a lot of phenomenal programs. Having spent a bit more time in the museum field, I keep on returning to lessons I learned during my time at the Alamo. I learned that you can, and should, communicate the latest scholarly understanding–the key is not “dumbing down,” but rather communicating well. As the Texas General Land Office prepares to assume control of the Alamo, it would be well-advised to remember how much the Education Department does for public understanding of a major event in North American history–and how that department touches visitors at the state’s most-visited site. Nice blog. I’ll look forward to checking it often and learning more about what you’re doing. Well said David thank you for sharing this information. I would also be interested in reading about your experience with the Peace Corps.